Vancouver Coastal Health (VCH) serves more than a quarter of British Columbia’s population. It’s a $3.4 billion organization with 29 different services in multiple locations. That’s a lot keep track of, and a lot to prioritize when it comes to goal setting. VCH turned to Ethelo to gain feedback on 14 strategic youth mental health strategies in order to inform the organization’s strategic planning and make sure that its goals aligned with patients and other stakeholders. 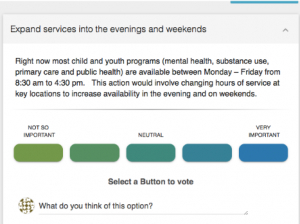 Not only did the responses collected through Ethelo help inform strategy, the organization found that its stakeholders were engaged and committed to providing input to shape the future of mental health in the region. VCH began the process of changing its entire care system in fall 2016. This included mental health, substance use, primary care and public health programs for children, youth and families throughout Vancouver. As that work progressed, the organization wanted to validate its goals and assumptions about strategic initiatives through a wider community to further refine the planning process. VCH used Ethelo to collect a final round of feedback on that plan before starting implementation. The company’s leaders know they only had one chance to get things right and had an obligation to deliver to its patients, community partners, and other constituents. A two-week consultation resulted in a 67 percent response rate, with a high commenting activity that resulted in clear guidance from an engaged group of stakeholders. The consultation itself focused on four main areas: integration of services, innovation, access, and service quality. Specific topics covered everything from hours of operation to the level of integration between VCH and the Vancouver School Board. Respondents ranked each topic on a scale of importance, and then Ethelo’s algorithm used those rankings to create a final list of the proposed changes that had the broadest level of constituent support. Many of the topics received more than 75 percent approval — suggesting that VCH was on the mark with the changes it was proposing after collecting feedback from stakeholders. At the end of the consultation period, the feedback from VCH about Ethelo was overwhelmingly positive. 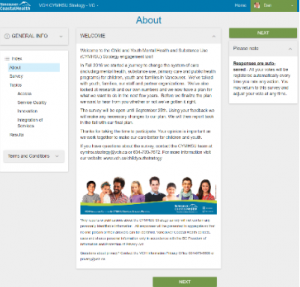 Read our case study about the VCH project for more detailed results and analysis of Ethelo’s partnership with Vancouver Coastal Health on the youth mental health initiative project.